BLOOD-RED Hardback spotted in the wild! There's been a BLOOD-RED sighting out there in the wild! Have you seen a copy anywhere? I have added a couple new items to the STORE. You may notice quantities are very limited. In the case of the new BoSP book, I should get more copies of both hardbacks and paperbacks, and of course Bottle of Smoke probably has copies too; as for All the Days, All the Things -- well, that's the last of them. It was my first book, way back in 1999. Someone wrote, looking for a copy, and I managed to dig up a couple -- so there's the last of them for anyone with a lonely shelf! The Chinese Gucci rewrite continues, so I better quit farting around and get back to it! 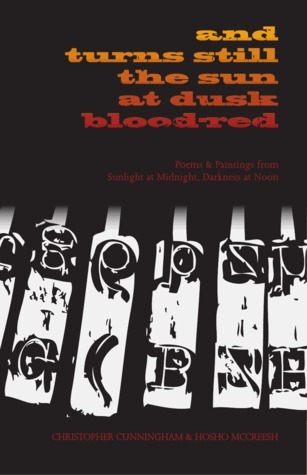 As those on my notify list already know, And Turns Still the Sun at Dusk Blood-Red poems from Sunlight at Midnight, Darkness at Noon by Christopher Cunningham and Hosho McCreesh, is available for order, and ships early March from Bottle of Smoke Press. It's a companion piece to the two nobody-poets' groundbreaking book of letters, Sunlight at Midnight, Darkness at Noon. In May, 2009, Orange Alert Press released Sunlight at Midnight, Darkness at Noon: The Cunningham/McCreesh Letters Vol.1. As part of that release, 26 stunning lettered hardbacks were made by the incomparable Bill Roberts of Bottle of Smoke Press. It's something most book collectors in general have seen—a limited edition hardback, often more expensive—to accompany the trade paperback. But we wanted to make something extra special for all those early supporters. Then it dawned on us: what's better than owning a broadside, or some other uber-exclusive production? A manuscript…an actual typewritten original. Now this was an idea! So we got to typing: a double-sided manuscript broadside, featuring an original, unpublished poem from each author. But not just any ol’ new poem—no sir!—one written specifically for the project…with a title pulled straight from the original letters themselves. Yes, a new poem, by each author, off of their respective typers, signed and everything. Collected here for the first time ever, are the final spoils: those 52 poems from the lettered copy hardbacks—bringing the entire opus full circle. Rarely in life does something as truly terrific as SUNLIGHT and now BLOOD-RED ever happen. From the original wild-typed letters traded between two strangers in 2002, to 13 years later, seeing how a few of those banged out lines dashed off in the sinking midnights have morphed into this. It celebrates everything that is wondrous about the small press—personal, approachable writing by unknown writers, most working day jobs and hoping to make the occasional buck while chasing their humble dreams. The fact that Bottle of Smoke manages to then wrap it all up in gorgeous, collectible artisan productions is further evidence of the vast, undiscovered culture of makers, doers, and creators—the life-blood of the small, artisan, independent press—putting out work that is far more adventurous than any large press (with their bean-counters making decisions based not on art but on the bottom line) can gamble on. We offer this up with our deepest and most sincere gratitude—to all who've supported us, and all who've made us look so damned good. If you have a Goodreads account, log in and sign-up for the And Turns Still the Sun at Dusk Blood-Red... giveaway (available in the US, the UK, Canada & Australia). It comes to you courtesy of Bottle of Smoke Press and the co-authors (read as: Chris and I). We're offering up 2 copies, and hope they both go to someone like you who'll love 'em! The giveaway ends February 28th, 2016. Giveaway ends February 28, 2016.